A good fairness cream in the market which hold very good reputation. As I used it for the three months two times a day, my skin is changed little bit. am a person with black complexion. I was first suggested from my friend to use this cream, I continuously used it for three months and I am well satisfied with it. I was surprised to see fairness in my face. I trust this cream always and I will never stop using this cream in my life. I want to be a man with white complexion and I think my dream will come true if I continue using Fairever. After using men’s fairness cream I was never satisfied but now with it I am well satisfied and I will always use it until I change to white. of thinking and I assure that It will really work. If anyone wants to try it, it has a package of pouch also which is very cheaper and any one can try it. 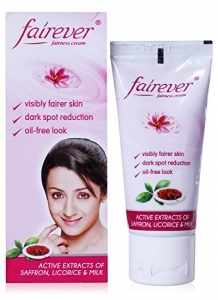 In my view stop wasting money in costly fairness cream and start using cheaper and best fairness cream “fairever”. i am happy to reuse this product after 6 yrs. use twice everyday. face will become fair than rest of the whole body. its a fairness cream only and not any sunscreen as it is not mentioned in the pack. There is no need to mention about being a sunscreen cream. The ingredients clearly indicate that Fairever is intended to be used to keep face glowing and radiant. It is also not expected to whiten the skin, as misunderstood by many consumers. A user should also use a sunscreen cream while going out in the Sun exposure. There is documented side effects of Fairever Saffron whitening cream. Women at my home are already using it, and they are happy with the outcome. The Saffron (Kesar) is quite popular in our country, as you might know. To avoid any possible side effects (if any), I would advise you to massage your face quite softly with this cream. Don’t rub.